← The Half the Sky Foundation to Screen The Invisible Red Thread at Berkeley University! Last Friday, a small screening of The Invisible Red Thread was held at the University of California Berkeley. The twenty in attendance were a mix of high school and college students, parents, as well as some young children who all seemed to enjoy the documentary! An insightful discussion followed the screening as some college student adoptees responded to how they felt about going back to their countries of origin. A wonderful evening was had by all! Once again, we would like to thank the Half the Sky Foundation for organizing this screening, as well as Berkeley Undergrad and Half the Sky Foundation volunteer Nicole Lee for coming into contact with us! 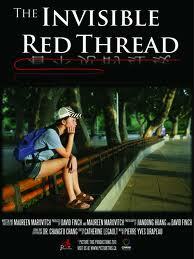 If you are interested in holding a screening of The Invisible Red Thread, visit this page to learn how! Based in Berkeley, the Half the Sky Foundation is a non-profit organization which provides caregiver training and loving, family-like care, to enrich the lives of orphaned children in China. This entry was posted in Uncategorized and tagged adoption, award winning, China, Documentary, montreal, Picture This, screening, The Invisible Red Thread. Bookmark the permalink.